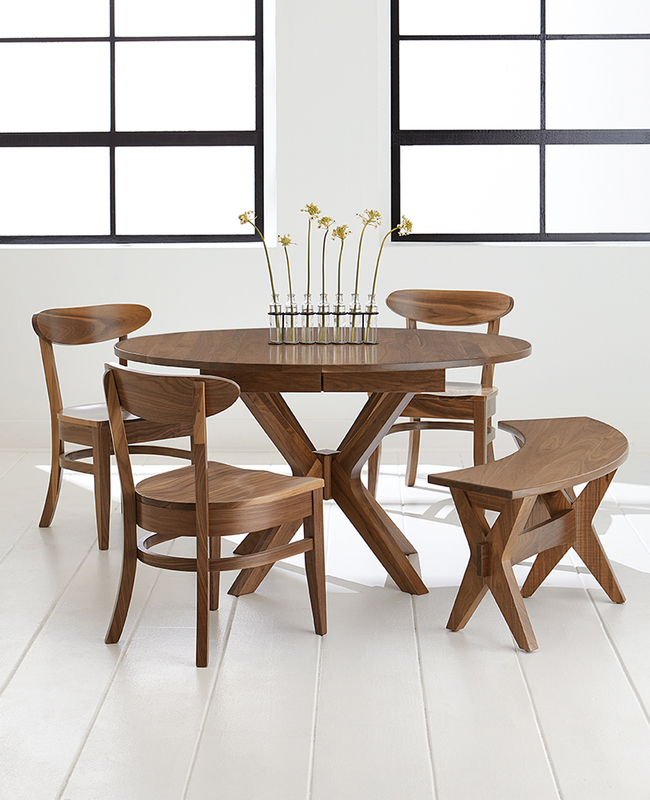 The Vadsco Table has an uniquely shaped top and a modern pedestal base created by Amish furniture craftsmen. The top has an egg shaped top and is 1″ thick. The apron is set in toward the base. This gives the top a lighter feel that pairs well with the sleek base. The table top has a mission edge profile. 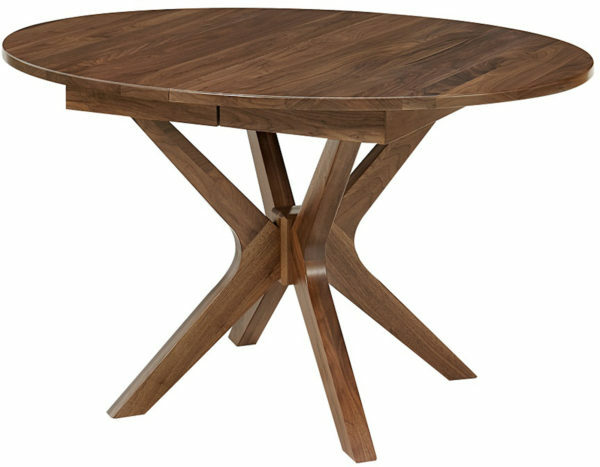 As a result this table has an eye catching presence in any dining room. Your dinner guests will be impressed with your sophisticated choice in furniture. 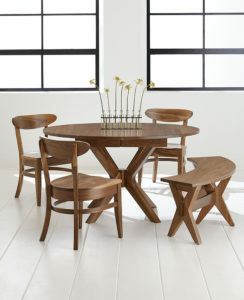 The dining table is shown in Walnut. You can also choose from Oak, Cherry, 1/4 Sawn Oak, Brown Maple, and Rustic Cherry. Other options include the table size, leaf quantity, and stain options. 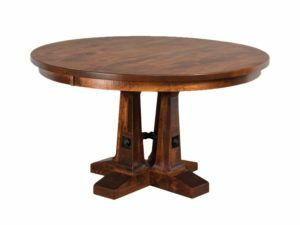 Due to these various options the pedestal table will be a perfect fit for your home. The table can be constructed with a 42″ or 48″ width. The standard length is 54″. The table can be made as a simple solid top without leaves. In addition to the starting size, a 12″ leaf can be added. The table also has a matching Vadsco Bench that matches the radius of the table top. Finally, compliment the dining table with one of our many dining room and kitchen chair options. 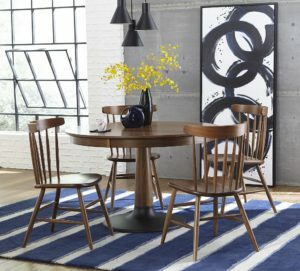 Have more questions about the Vadsco Table? 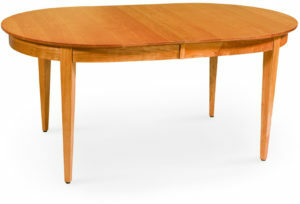 Be sure to CONTACT Brandenberry Furniture to learn more about this table and the size options. Our sales staff is knowledgeable and would love to help answer any questions you may have about our Amish furniture and pedestal tables. Also, you may want to make a trip to VISIT the Brandenberry Furniture store in Shipshewana, Indiana. Our store is located in the heart of Indiana Amish country. Enjoy the slower pace of life and see what an attention to detail and passion for hard work can create. The furniture store features an entire line of dining tables, kitchen chairs, bar chairs, barstools, hutches, and buffets. Come see our offering of handcrafted dining room furniture in person. Because the quality of furniture like the Vadsco Table will speak for themselves.